2018 Bio-Blitz a great success. The 2018 Walbran Bio-Blitz was another great success as we enjoyed the sunny weather and the vociferous spring bird song. Thanks to Pacheedat elder Bill Jones for welcoming us onto his territory, David, Ben, Juliet, Adolf, Uluna and James for sharing their deep knowledge and to Erika from Wildfire bakery for providing the delicious lunch. 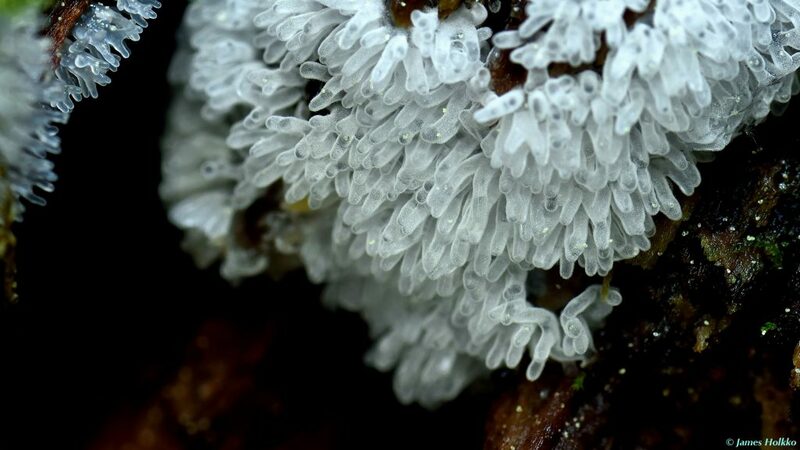 Highlights were the calls and sightings of Marbled Murrelets very early on the Sunday morning, the Merlin, a falcon that was in the Castle Grove and the many types of colorful slime mold, (see picture above) that were found. To view the full list of flora and fauna go to the Archive section of this site. See you all again next year or at another FoCW event in the Walbran, check calendar below. 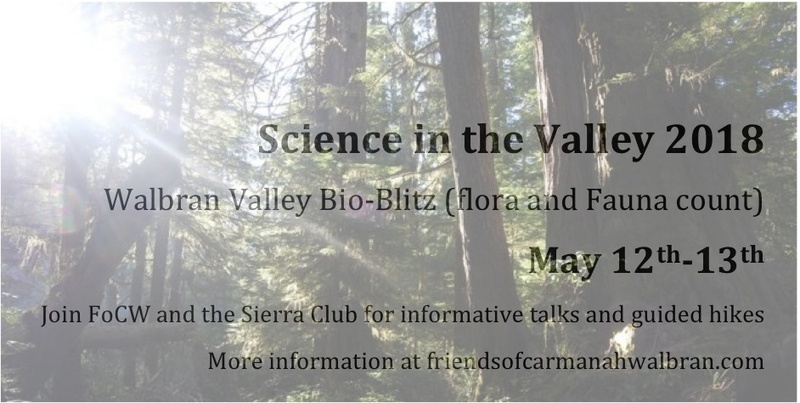 Join FoCW and the Sierra Club for the 4th annual Science in the Valley Bio-Blitz (flora and fauna count) in the Central Walbran Valley (Kaxi:ks) on unceded Pacheedaht traditional territory on the weekend of May 12-13th. 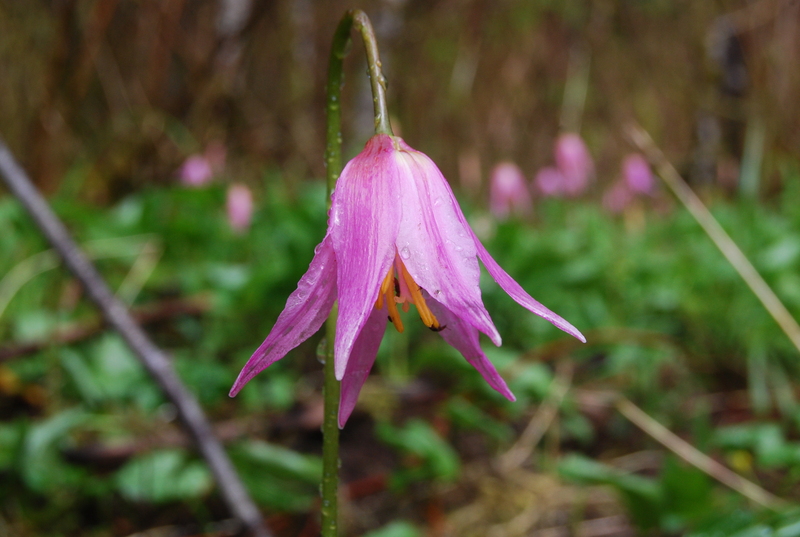 Spring is the time when the temperate rainforests really blooms into activity. This years event has expanded to included two days so that we have an earlier start on the Sunday morning when many birds and animals are most active. One of the bird species we are hoping to see and hear are the Marbled Murrelets as they navigate to the ocean from their nests high up in the forest canopy. Attending experts in; Bird song identification, Goshawks, plant biology, forestry, soil ecology, Owls, Entomology. Light lunch, soup and bread supplied by Victorias Wild Fire Bakery. 1pm; Welcome from elder Bill Jones of the Pacheedaht FN, introductions from groups and experts. Easy/medium difficulty hike ‘Tolkein Giant’ trail, 1 hour. Medium + difficulty hike, Castle Grove/Giant trail, 2 hours. Hard difficulty hike, Harriet Nahanee memorial Trail, 3 hours. After dinner evening ‘Owl and Bat Hike’! 6am; Bird identification hike starting on Walbran bridge. Rain and shine the volunteers from FoCW and the Wilderness Committee have worked hard again this past year repairing and upgrading the trails and boardwalks within the threatened Central Walbran valley. This important work helps protect the delicate root systems and soils of the rain forest, mitigating the impacts of the growing numbers of visitors who come and experience this amazing place. To ease the wear and tear on tent spots within the forest and to accommodate visitor numbers, volunteers have also worked to create camping spots along the edges of the logging road. FoCW and W.C with all donated labor and funds will again in 2018 be working to improve access to this area and to continue to lobby for its protection. The 2018 calendar of work groups and events to be posted soon. So many to thank, but a special shout out to Will, Olvier, Alex, Mai, Ron, Michael, Tom, Deric, Bill Jones, Jon, Emily and Torrance and all the hard working WC volunteers. Rave for the Rainforest and Equinox Party. Join us and dance through the night, from dusk to dawn, on the Autumn equinox at the Sunset Room to celebrate and raise awareness and funds to help save some of the last and most magnificent temperate rainforests in the world in the heart of the Walbran Valley ( unceded Pacheedaht territory), south Vancouver Island. Victoria-born and Bali-based DJ Alex Joy ( Joy Collective and Rainforest Pavillion, a fusion of electronic dance music and ecological conservation culture) and an exciting line up of home town heroes including Mr Moe, J-Feud and Jon Galssey and DJS Daniel Pierce and Tada Hozuma, will serve up the music to keep you dancing all night long. This event is happening on the territory of the Lekwungen peoples of the Songhees and Esquimault nations and is supporting the work of the Friends of Carmanah Walbran, a local Victoria, 100% volunteer-based collective working to protect and providing public access to the threatened heart of the Walbran valley, a rare world-class ecological heritage of ancient temperate rainforest, 3.5 hours drive from downtown Victoria. Tickets $15 – $20 donation at the door. The space is wheelchair accessible and can be entered via the gates at the end of Herald Street below Value Village. Brought to you by Deepend Promotions, Rainforest Pavillion & House Music Victoria in collbaoration with the Friends of Carmanah Walbran. 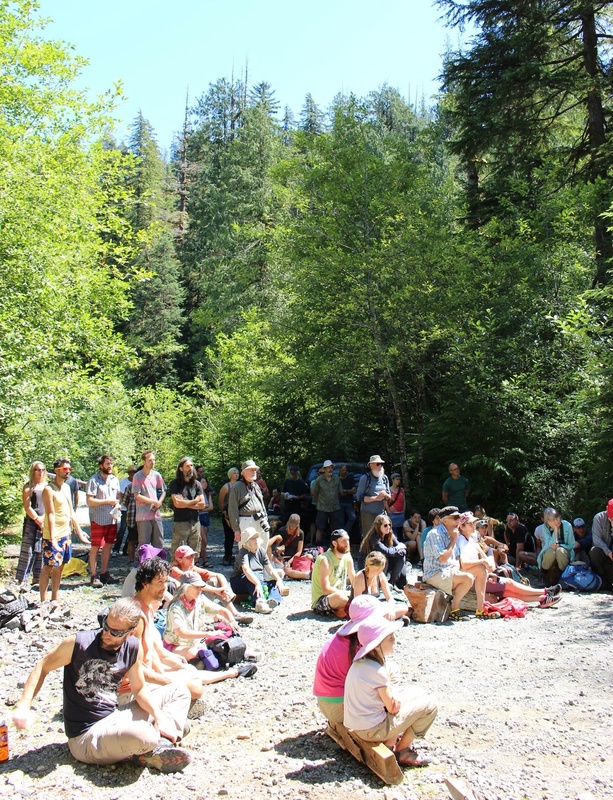 The 4th annual Walbran Convergence was a great weekend for the 100+ people who came out to help protect this special place. Thanks to Bill Jones and Shawna Green for their continuing support, Port Renfrew’s Soule Creek Lodge for putting together the dinner, the Sierra Club volunteers for making the Sunday Breakfast happen, the drivers from Community Action Bus and the Forest First Express Society Bus and all the volunteers from W.C and FoCW. With these events we amply demonstrate that we are not going away anytime soon! See you next year. Or register for the September 22nd-24th trail and boardwalk work group with FoCW and W.C! Friends of Carmanah/Walbran and Wilderness Committee are thrilled to announce this year’s 4th Annual Walbran Valley Convergence! 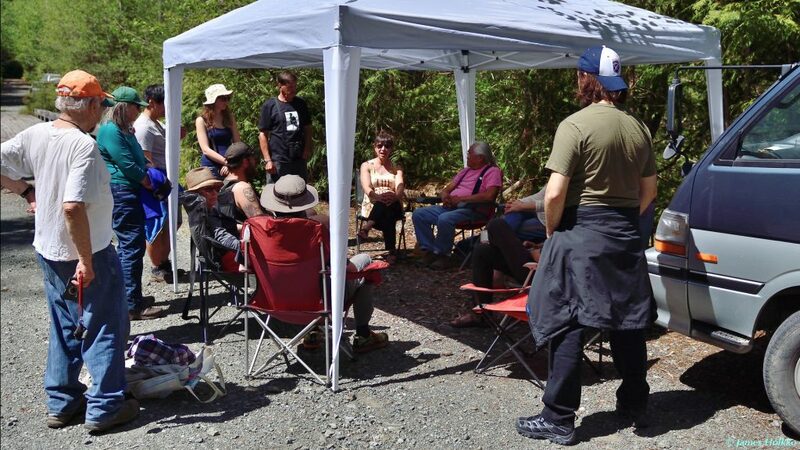 On July 29-30, more than hundred people will gather in the Central Walbran Valley (Kaxi:ks) in the unceded territory of the Pacheedaht Nation. Scroll down for event itinerary! 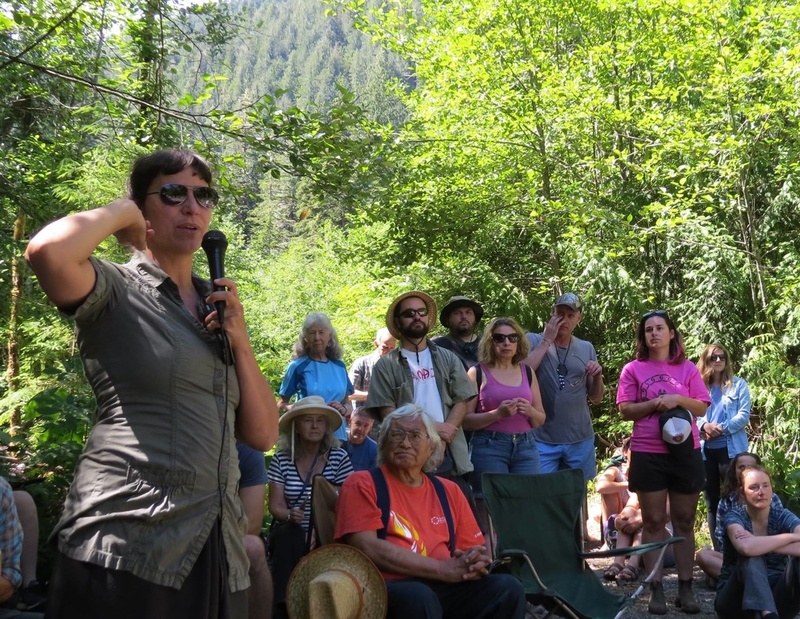 This annual event is a recognition and a celebration of the first wave of activism in the Walbran Valley – 26 years ago this summer! – that saw part of the Valley protected from destruction. It’s also an opportunity for people to come together in one of Canada’s most spectacular ancient rainforests and discuss how to better manage these incredible ecosystems and build a truly sustainable forest industry.. This years’ theme is building unity, and the formal programming will highlight a diversity of voices, including Indigenous leaders, forest sector union leaders, elected officials and biologists. At 5pm there will be a Salmon Dinner. Tickets available through picatic or are available at Wild Fire Bakery or RSVP through email and pay on the day. See menu below. 9am; A Pick your own Berry Pancake breakfast hosted by the Sierra Club; By donation. 10:30; Workshops; Bird song identification: Building diversity: Forestry Reform and more. This weekend is always an inspiring and powerful event and is sure to be one of the highlights of your summer. We’re working to make the event as accessible as possible, and are organizing return daytrip transportation on the Community Action Bus on Saturday. Round trip bus tickets are being offered at a subsidized rate of $30 per person or each or at the full cost of $50. The bus will be leaving Saturday morning from the Vic High parking lot (on Gladstone & Chambers) at 7:30am with a pick up in Duncan at 8:45am and coming back the same day, leaving the Walbran at 7pm (after dinner). We should arrive back in Victoria by 11pm. The Forest First Bus (12 seater bus) will be leaving Victoria to the Walbran Vie Sooke and Port Renfrew, Saturday, 7.30am. Please email us for more info. Please use this page to organize carpooling and other ride shares! **BUS TICKETS: Available online through Picatic ($5 fee included, $30and $50) or at Wild Fire Bakery (1517 Quadra Street at Mason, $25 and up). **TICKETS: Available online through Picatic ($5 fee included, $20and $40) or at Wild Fire Bakery (1517 Quadra Street at Mason, $15 and up). We need a lot of volunteers for set-up, take down, food prep, hosting elders, parking, etc. Please email friendsofcarmanahwalbran@gmail.com if you`re interested in volunteering! If you would like to support Friends of Carmanah/Walbran’s campaign to Save the Walbran Valley please feel free to make a donation through Picatic, at Wildfire Bakery, by email transfer to friendsofcarmanahwalbran@gmail.com or bring cash to the event, there will be a donation jar! We really appreciate your support! We would like to acknowledge that this event will be taking place on the traditional unceded territory of the Pacheedaht First Nation. Sponsored by: Friends of Carmanah Walbran, Wilderness Committee, Forest First Express Society, Sierra Club, Island Forest Futures ( IFF).